When you’re wrapping up those Christmas presents and putting them under the tree, don’t forget your favorite furry friend! Serve your pup his food or water in a custom-made bowl emblazoned with his name. Keep your pooch warm this holiday season and get into the festive spirit with a soft, cuddly dog sweater. This sweater, decorated with holiday-appropriate reindeer and snowflakes, is one of our favorites. It comes in a non-itching and warm material and is available in a variety of sizes. You may already get subscription boxes every month, featuring everything from food to makeup. Did you know that you can get a subscription for your dog, too? When you subscribe to Barkbox, you’ll get a curated assortment of toys and treats each month. 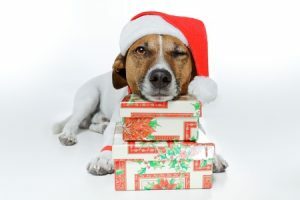 Promote oral health and give your dog something to chew on this Christmas. This rawhide chewable stocking also comes with candy cane-shaped chew toys for maximum enjoyment. If your pooch never wants her games of fetch to end, this one’s for you! This automatic tennis ball thrower will give her all the fun she wants without tiring out your arm. Thinking of adding a dog to your family this Christmas season? Check out Pauley’s Pups, where you’ll meet an adorable assortment of sweet, friendly puppies and toy breeds. Contact us at 804-798-7877 to learn more and schedule a visit!